Home / Real Housewives of New Jersey / Giudices vs. Gorgas: The Yearly Family Christmas Card Showdown! Giudices vs. Gorgas: The Yearly Family Christmas Card Showdown! It's that time of year once again! Man, 2013 has flown by so fast! I know I've been slacking on the updates but sometimes a girl needs to relax, drank some wine, and eat massive amounts of chocolate chip cookies. 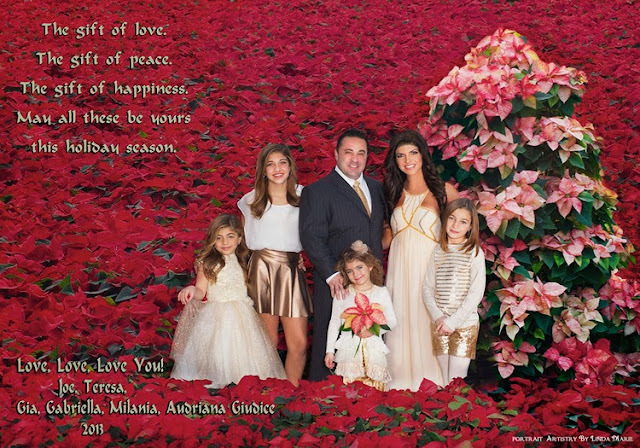 Don't worry, I'll be back on my blog grind in the next few weeks but for now, I wanted to see what y'all thought about the Giudices and Gorga's annual christmas cards. Which card do you prefer? I personally think both cards are beautiful but I wonder why Melissa and Joe Gorga aren't pictured in theirs? Either way, I would be more than happy to receive either one of these cards in the mail. How about you? In other news, Teresa and Melissa seem to be getting along lately. The feuding sister-in-laws recently met up with Kathy Wakile and her sister Rosie for a "cousin's Christmas dinner". Apparently, they have all kissed and made up (for now).